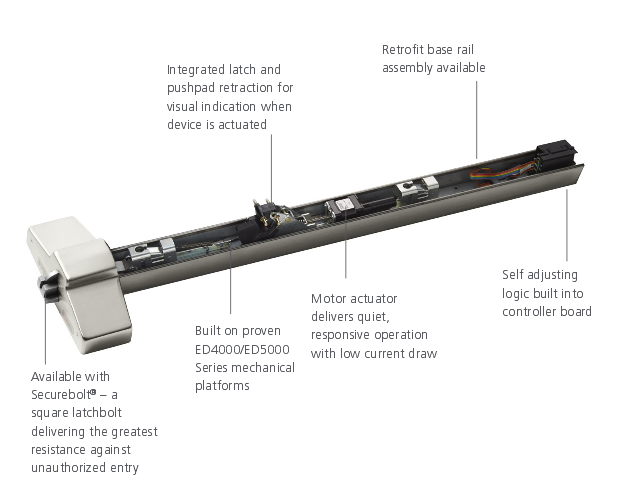 The Motorized Electric Latch Retraction (MELR) exit device from Corbin Russwin provides remote-controlled latch retraction that delivers quiet, smooth operation for convenient, hassle-free egress. The MELR is easily installed in new applications and available as retrofit assemblies for field updates. It features a maintenance-free design with few moving parts and uses 86% less power during retraction than solenoid devices. Plus, MELR is powered by a standard power supply, simplifying installation and increasing system design flexibility. For more information call us today (801) 263-2700.